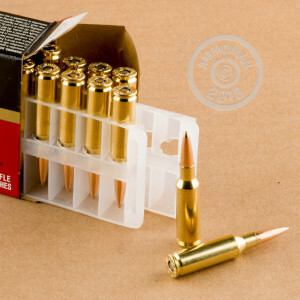 The MatchKing is Sierra’s foremost target bullet, optimized for pinpoint accuracy in every way. 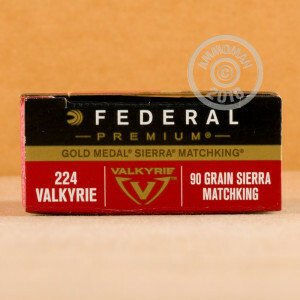 This 224 Valkyrie cartridge from Federal’s Gold Medal line of ammunition features a 90 grain MatchKing, so whether you’re aiming to take the gold at your next competition or simply in pursuit of jaw dropping accuracy, then you’ve found your round. The MatchKing owes its great accuracy to many factors, such as its boat tail design and extremely narrow hollow point meplat, both of which significantly raise the bullet’s ballistic coefficient. The MatchKing’s stellar rotational stability comes from its thin and extremely concentric jacket, and its weight is meticulously controlled for as well. All of these features combine to deliver superior rotational stability, heightened resistance to cross winds, and a laser-like trajectory. 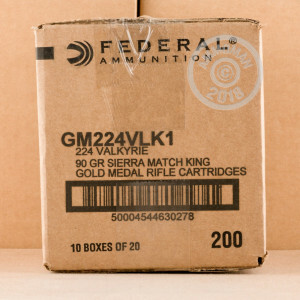 Federal hasn’t deprived this round’s MatchKing bullet of any high quality components. Its benchrest-quality Gold Medal primer delivers consistent performance, its brass casing is incredibly uniform throughout, and its propellant burns clean to save your action from accumulating excessive corrosive residues.